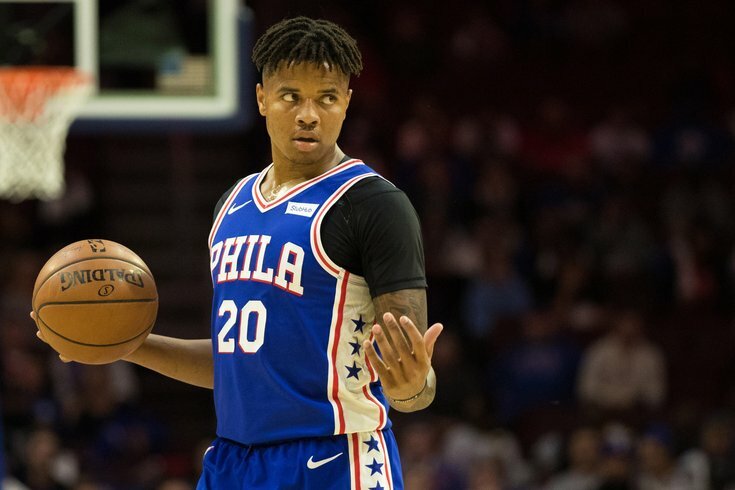 Markelle Fultz will see a shoulder specialist next week at the behest of his agent, Raymond Brothers, according to a report from David Aldridge of The Athletic. According to Aldridge, Fultz will be removed from practices and games until the second-year guard is able to see a specialist, effectively ruling him out until at least early next week. Brothers would not offer a comment on the situation to PhillyVoice but confirmed via text that Aldridge's report is accurate. To say the timing is curious would be an understatement. Fultz spent the second half of last night's game on the bench after an ineffective first half against the Phoenix Suns, making way for T.J. McConnell. Rather than chalking this up to a matchup decision, Brown gave some curious comments to Philly.com's Keith Pompey when pressed on who would be the team's backup point guard moving forward. BROWN (concluding answer on whether close win was disappointing): I thought by and large the first half was flat, we needed an injection, I came in with TJ, shuffled the lineup a little bit. Glad to get out of there with a win. POMPEY: So you came in with TJ, are you going to keep TJ at the backup point guard? BROWN: I don’t know. I don’t know. POMPEY: What’s going to be the determining factor? BROWN: Just when I think it through deeper and look at tape, and see who we’re playing, the next opponent, all those things that I should do. After a tweet from trainer Drew Hanlen surfaced (and was later deleted) in early November suggesting Fultz was not healthy, reporters spoke to Fultz at the practice facility on November 6 about his health. The guard asserted forcefully that he was okay. "For sure," said Fultz on November 6. "I mean nobody is ever 100 percent healthy in this game. You play five games in seven days and you get bumps and bruises. That's life in the NBA. It's the stuff you signed up for when you get here. But I'm working every day to get better." Fultz also specifically addressed the shoulder in an exchange with Dave Uram of 94 WIP on November 6. URAM: How does your shoulder feel, how does your shot feel? FULTZ: Everything feels good. I'm out here playing, you see me competing every day. My shot could get better, it's all about putting in work like I did this summer. "To the best of my knowledge, he's healthy enough to go do what he's doing. I only learned about the, what was it, what do we call it, the tweet," Brown said at the same practice. "He will speak for himself, but he's been playing basketball and doing well. He's fine." On the subject of his oft-scrutinized shot, the only three-point attempt Fultz has taken since Halloween came on a 3/4 court heave at the end of the first quarter in Monday night's game against Phoenix. The Sixers had not returned a request for comment at the time of publishing. FROM EARLIER THIS YEAR: What has really been going on with Fultz?